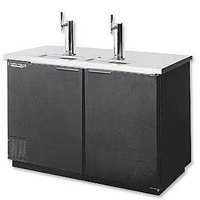 The Beverage-Air DD58 Commerical Beer Refrigerator is a commercial grade kegerator with a 3-keg beer capacity, two 3" insulated chrome single-faucet draft beer towers, a heavy-duty stainless steel top, forced air refrigeration and two self-closing doors with locks. The DD58 is available in a Black Vinyl or all Stainless Steel exterior. Comments: Purchased my Stainless DD58 four years ago from Bev Factory, never had a problem. Only I seem to have more friends now than before I purchased the rig. I usually run Guinness and Coors Light all the time. I leave the 3rd tap for local brews like Ballast Point or Stone. Buy one, you'll be glad you did!!! Comments: I purchased this kegerator to go in my outside bar. It is keeping the beer very cold. I was comparing it to the DD50, however, for the extra money I would recommend the DD58 because it has the option to hold more kegs. I currently am running a Coors Light on one side and Bud on the other. I am probably going to order a different tower in the future to be able to get a larger variety of kegs.